This is a project that I've been procrastinating about for the longest time, finally got the time to do it! This is the 4th version of my LED costume - Could be the most elaborate costume project yet! With every version, I learn a little more! Just the planning process on paper took me hours of drawing and redrawing. In this version, I tried a 12v supply for the first time, with 4.2v across each LED, trying to achieve at least 20mA for each light! The final wiring diagram! Not the most perfect, but the least complicated wiring I could come up with..
Buying the parts! Sim Lim Towers is one of my favorite places! I could spend the entire day there shopping for inspiration! Positioning the lights is one of the most time consuming parts of this project as it is difficult to measure and mark the placement on fur. I just relied on trial and error to make the distribution of the lights work. Yikes! Made a mistake and burnt a hole in the costume, luckily it didn’t show up in the fur! Final step! Attaching the blinker circuit and battery pack! Finally done with phase one of the project: just 36 LEDs for now. For the 2nd phase, I will add 24 more LEDs that will run on a different flashing circuit! I couldn't wait to test it out on stage, so I used it in my show that night! People who know me, know that I have this crazy obsession with lights, and spend much of my spare time attempting to put LEDs on everything! Catch my next blog post for some of the more useless circuits that I've created! In the meantime.. This is one of my projects from a long time ago! 128 LEDs on an instant (Pro-X) backdrop! It has 32 programmable sequences with 8 variable speeds. It’s a remote controlled operation and doesn't require wall power! It runs for more than 4 hours on a single battery charge! I used it in the finale of my production of WAAH Magic, back in 2009. This act has the older version of my LED costume (Ver3.0). The blinking circuit was more random then. Creating lights for costumes has been my hobby for the longest time. I've lost count on the number of projects I've done so far. I've made many costumes for big musical productions in Singapore, as well as creating 250 LED costumes for my mass display item at the Asian Youth Games opening ceremony; An epic project! Luckily I had help from my friends Imran & Jeremy Tan! How can I forget spending hundreds of hours soldering and wiring each and every costume! It was all worth it! Check out the final result in this video! The lights are at their full glory about 5:20min into the video. Kiki's crazy obsession with lights! What is *SCAPE Magic Carnival? During my more than 10 years in the industry, I have been blessed with countless opportunities. I wanted to find a way to pay back. 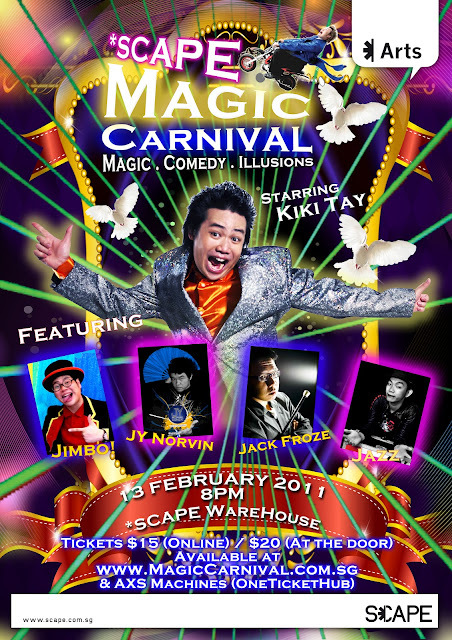 This project of mine, *SCAPE Magic Carnival, is a monthly production featuring amazing acts from Singapore! I wanted to create a platform for young, up and coming magicians to showcase their talent! This was exactly what I needed when I started over 10 years ago. Lately I've seen so many amazing acts performed by many talented young magicians. They have great acts and are extremely passionate about their craft, but lack a platform to showcase their skills! This project aims to provide them with just that! Each month, we feature different talented individuals and their acts! The nice people at *SCAPE have been so supportive of this cause, and I wouldn't have been able to do it without their help! Welcome to *SCAPE Magic Carnival! Guys hard at work preparing for the show! My Heroes! Jazz, Norvin, Jack & Jimmy! And don’t forget Xiangzhi, who unfortunately couldn't join us that day! Just two more weeks to showtime! Have you got your tickets yet? Find out more at www.MagicCarnival.com.sg! Getting my table top pet! I went to Qian Hu, one of the largest exporters of ornamental fish! They stock all sorts of exotic aquarium pets! 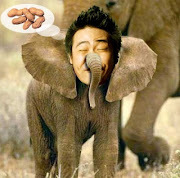 Found some other unusual pets at Qian Hu! Quit starring at me! I said NEXT TIME! Got a nice tank and some lobster food! They are extremely cute, fun to play with and make great table-top pets! I let them run around my table while I'm working! I used to keep 4 of them as pets many years ago. I remember the shocking moment when I came back home one day to find FIVE lobsters, two of which were dead! I felt like I had entered a twilight zone. I simply couldn't explain why there were 5 lobsters when I had only bought 4... After close examination, I realized that one of the lobsters had actually molted (came out of its shell) and that while he was in his soft shell state, the other lobsters had attacked him. It is amazing that lobsters actually come out of their shells, leaving behind a perfectly intact shell husk that looks like a whole new lobster! Found this video on YouTube of a lobster molting! Enjoy! Kiki Tay's Hero-of-the-day Ernesto Planas! Remember my older post when Ernesto visited me in Singapore? He had stopped in Singapore on his way to perform in the show "Le Plus Grand Cabaret du Monde"; a prestigious TV show where the best in the world perform! Here is the clip from the show! I've watched it over and over again and I'm still amazed! I thought I'll share it with you... Enjoy! What sets Ernesto apart from many other magicians that do parasol (umbrella) acts, is his distinctly unique performing style. Much of the complexity of the performance is hidden from the layman and can only really be appreciated by fellow magicians. Many magicians can perform a parasol act, but not many can perform it with style, charisma and charm like Ernesto does. Notice that throughout his act, he is always facing forward with no awkward, unnatural or sneaky movements. Notice too that he starts his show on an almost empty stage, and ends his show with the entire stage filled with parasols! While Ernesto was in Singapore, he gave an impromptu lecture at the Singapore Association of Magician's magic meeting. In the lecture he highlighted the importance of theatrical performance for magicians: the movements, postures, showmanship and energy. He truly is an inspiration and an example that many magicians can learn from! One more for magicians out there! Ernesto's AIR FORCE ONE! Despite his tough (mafia-type) front, Ernesto is in fact, a very very nice guy! That makes him Kiki Tay's "Hero-of-the-day"! See my older post here! Come catch my latest production! 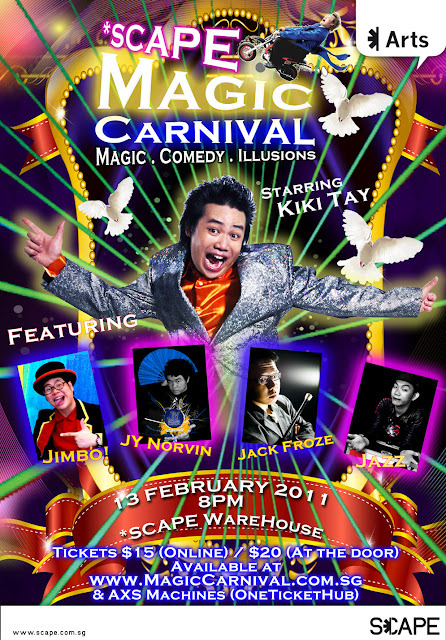 *SCAPE MAGIC CARNIVAL! Extreme Magic, Comedy & Illusions! 13th Feb 2011 @ *Scape Theatre! Tickets $15 available online here!